Late March means that it’s time to order your mulch! Residents all over northern Virginia are placing their orders and having the bagged mulch or bulk mulch stacked or dumped in their driveways. This is the standard by which all other mulches are measured. Hardwood mulch has a beautiful dark brown color when new and keeps its appearance up all season long. What about single or triple shredded mulch? Some customers ask about the “double shredding” aspect. When we make mulch, grinders are used to take waste forestry materials and grind them down. A single shred leaves a mulch that contains pieces that are a bit larger than what you would see in a typical front yard bed application. Single shredded mulches are typically used where you don’t want the mulch too break down as quickly. Paths, walkways, and larger semi-wooded areas are common places to use a single shred. For Double Shredded Mulch, we run the material through a smaller screen a second time, producing the common double shredded appearance. Triple shredded mulch is used sometimes too. In this case, we run the material through a third time, using an even smaller screen, which produces a mulch that breaks down much more quickly and is suitable for garden beds. Shop for Double Shredded Mulches Here! LumberJake makes our own colored mulches. Black mulch is our second largest selling residential mulch. Our dyed mulches are made of double shredded hardwood mulch and double shredded pine. They are mixed, and composted to 180 degrees before grinding. Then the material is dyed with a water color and stockpiled until dry. All microbes, organisms and insects are smothered and killed in a composting process. Just take a look out your back window…see that playset? That’s the perfect place for wood chips! Actually, playgrounds and tot lots are perfect for wood chips, but so are certain landscaping projects. When you need a garden soil/compost blend or top dressing material, it’s hard to beat our Topsoil/Leaf Compost blend. This material is made by processing Virginia top soil through a 3/8″ screen and amending with leaf compost. Rounding out the top 5 products ordered we’ve included an entire category. While this is definitely not a mulch, it is commonly ordered along side mulch products and is used in so many landscaping applications, we had to include it. Bulk stone and aggregates include pea gravel, river wash (in various sizes), landscape stone, River Jacks and even Patio Base (21A). These materials have tons of use from building patios and walkways to under-deck covering. 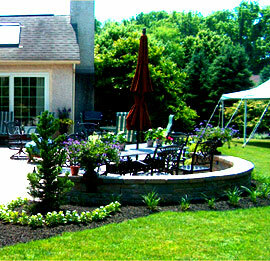 LumberJake makes all of our own mulches and forestry products from materials gathered right here in northern Virginia. By re-purposing forestry waste, we do our part to be a careful steward of mother nature and also help our neighbors keep their yards beautiful. Spring is here – did you order your mulch yet?